Thanks to Robson Greene I have just spent 2 glorious weeks in Cuba – SWMBO was enjoying “Extreme Fishing” it is the only fishing programme she can tolerate which was on Cuba”she tells me she likes Robson” and I was oohing & aahing over fly fishing for bones & how that is one fish I’d love to hook on the fly rod. What I need to tell you now is I have always managed to wiggle out of long haul flights on the grounds of at 6 ft 2 I’m just the wrong size for planes. 2 days later she says to me she has managed to find a deal for 2 weeks in Cuba at £800 a head staying in the Sol Cayo Coco & did I want to go – the answer from me was an emphatic yes. The hotel & staff were fantastic – the fish life in the sea around the hotel is amazing and the beaches brilliant. Round a rock at the hotel were clouds of sardines being hunted by predatory fish such as Jacks & Barracuda. 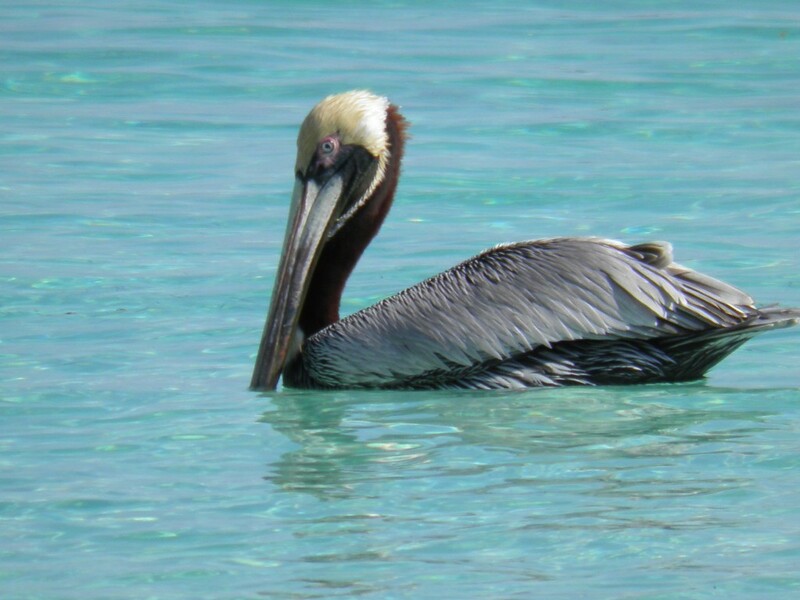 You can watch this real life action from the rock – hotel guests were trying to catch the fish – but the locals with hand lines seemed to do better than the guests & the most successful angler in Cuba was there too – the Pelican. 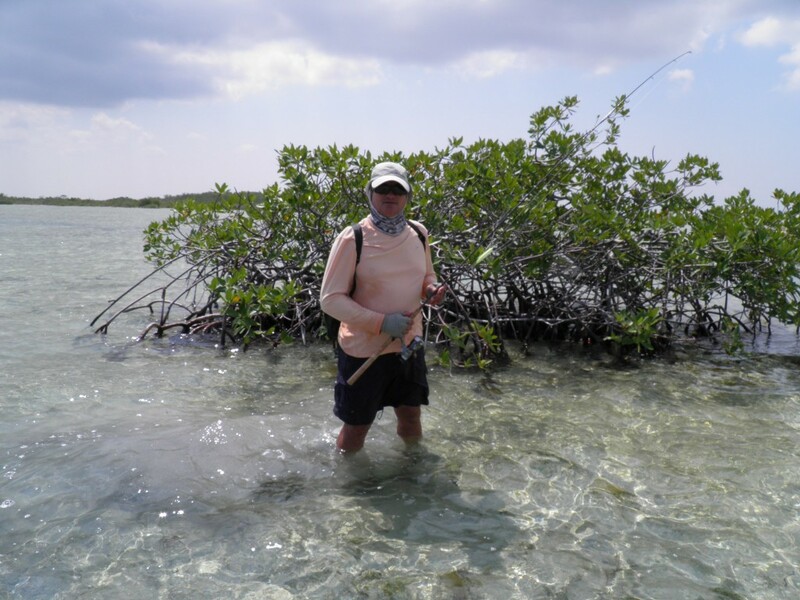 I had hired a guide before leaving “Orlando” and he was excellent – be aware though do not attempt his style of fishing with him unless you are physically fit – as a day spent wading up to 10 miles in shallow lagoons & mangrove in the sun is tough going. Also Orlando has a blog site where he advises a number of essentials – read it carefully. See link – thanks also to Nicolas & David Bell of GAC who kept me right & advised me what flies to buy. Orlando had a spinning rod with his home made rapala type lure & he spotted a Barracuda first – my attempt at covering it at distance with his kit was poor so he had a go covered it and it took he handed me the rod and had me play the fish – so not claiming this one as a catch. Alby looking like a proper angler? Alby the inept angler strikes again – Think if I was to do this again I would not buy a new rod and line then attempt to fish in a strong wind in a new country. Not only was my casting worse than normal every time Orlando spotted a bone fish my knees turned to jelly and my casting ability what there is of it collapsed completely. 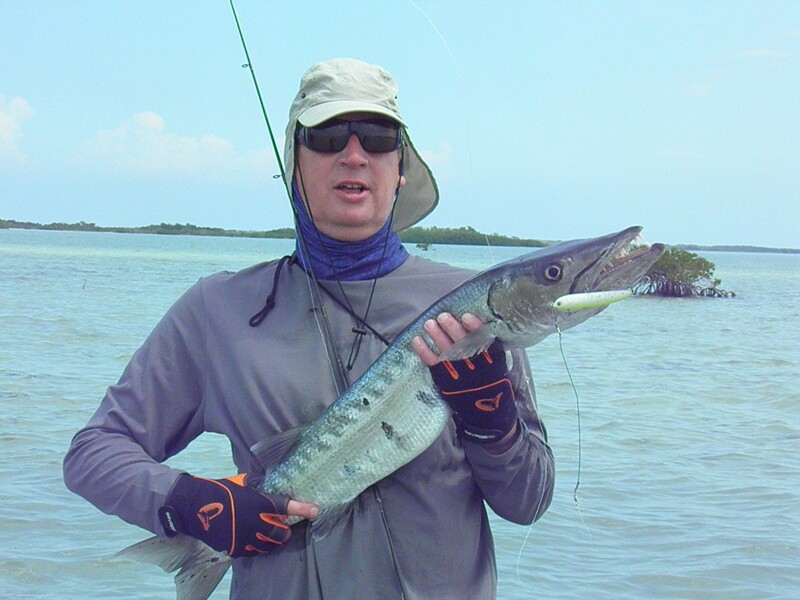 Be prepared to be criticised by your guide as I was when my lack of casting ability and nerves let me down at the most vital times – lets just say Orlando’s ability to spot bone fish and Barracuda is not to be questioned & I spooked many Bone fish before connecting my first. Everything they tell you about Bone Fish is true – they run with the speed and power you would not believe. This is no exaggeration – you need to experience it to understand. The Bird life on the lagoons is amazing on the first day we saw Pink Spoon Bill – Flamingos – Turkey Vultures. The fish life as well on the first day we saw Permit – Needle Fish – Barracuda – Bone Fish – Cow Fish – Snapper. The first fish I spotted was a Cow Fish (Box Fish) which I managed to hook and lose. 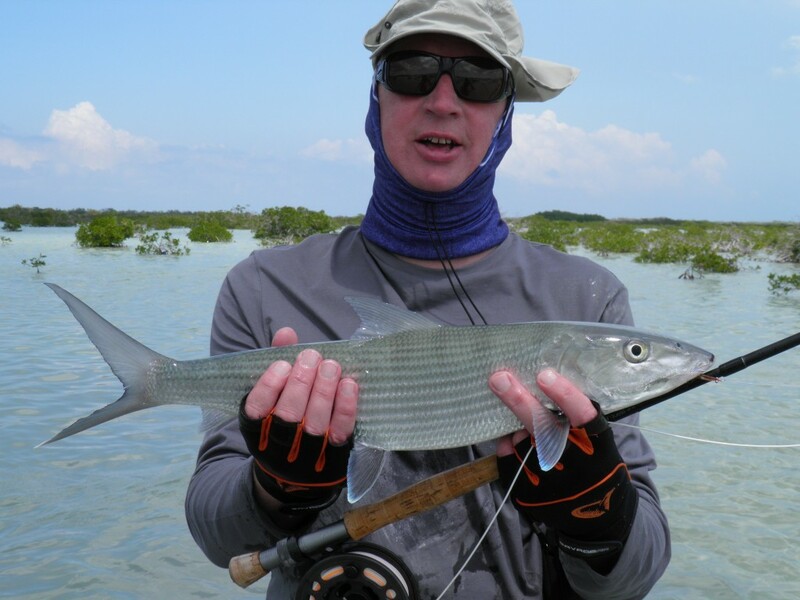 It took me some time to successfully hook a Bone Fish & not long after this i managed to hook this cracker which took a blistering run across a big shallow area & into the mangrove roots & thanks to Orlando’s coaching it was finally subdued. Spotting fish is critical & without an experienced guide catching a Bone fish would be pretty difficult. Here is a link to Orlandos blog his advice on the kit you need is spot on. 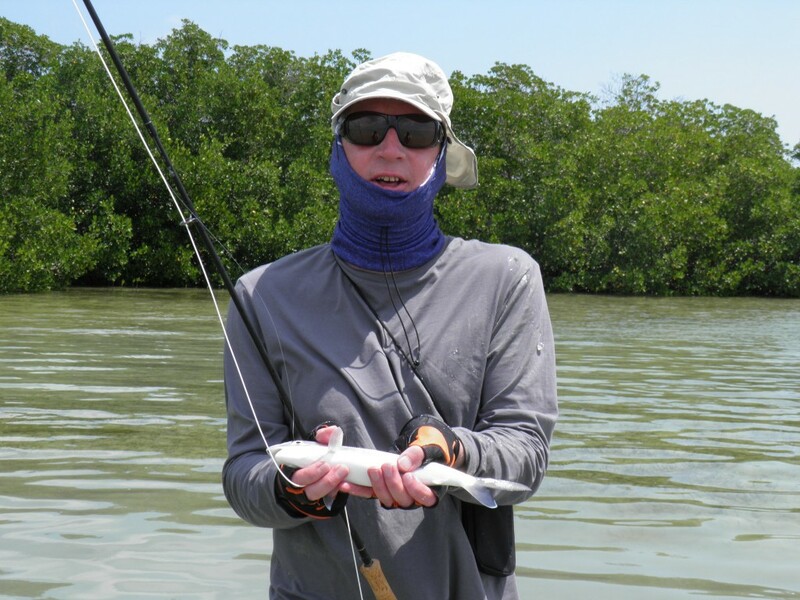 2nd day – wading again 7 bone fish – snapper & small jack – saw a ray in the shallow water only saw 2 barracuda. Decided towards the end of the holiday to have a go off these rocks with the Fly gear I think I was put off having a go earlier as everybody fishing was using live sardine as bait and had wished I had brought other kit was they were catching some good Jacks, Barracuda & Snapper. There was a fair old wind on my first attempt which I’m sure helped the movement of my flies – I hooked and lost what I think was a good Jack. The second day was even windier and I was beginning to wonder about how wise firing a weighted fly into the wind and worried about the damage the rock would do to my new fly line – however it was all worthwhile as I caught 2 Jacks one of which was a good one, a small snapper and a mackarel type fish with very sharp teeth. Tight Lines & if you have any reports on your own trips wether it’s on the UAAA waters or elsewhere please send your info in and we will publish it or alternatively like our Facebook page & post your stories and photos please.